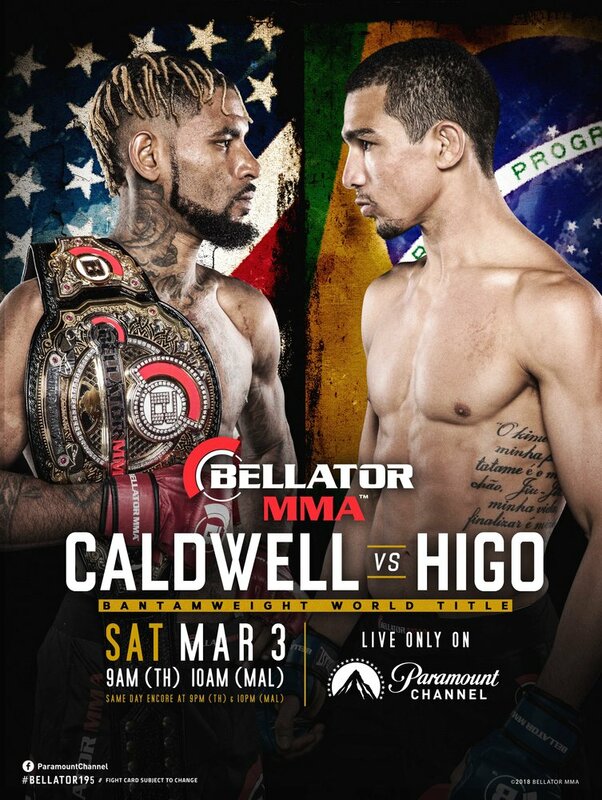 ASIA, 1 MARCH 2018 – The Bellator bantamweight championship will be up for grabs when Darrion Caldwell (11-1) makes his first title defense against Leandro Higo (18-3) at Bellator 195 inside WinStar World Casino and Resort in Thackerville, Okla., the same venue where “The Wolf” captured the belt earlier this year. 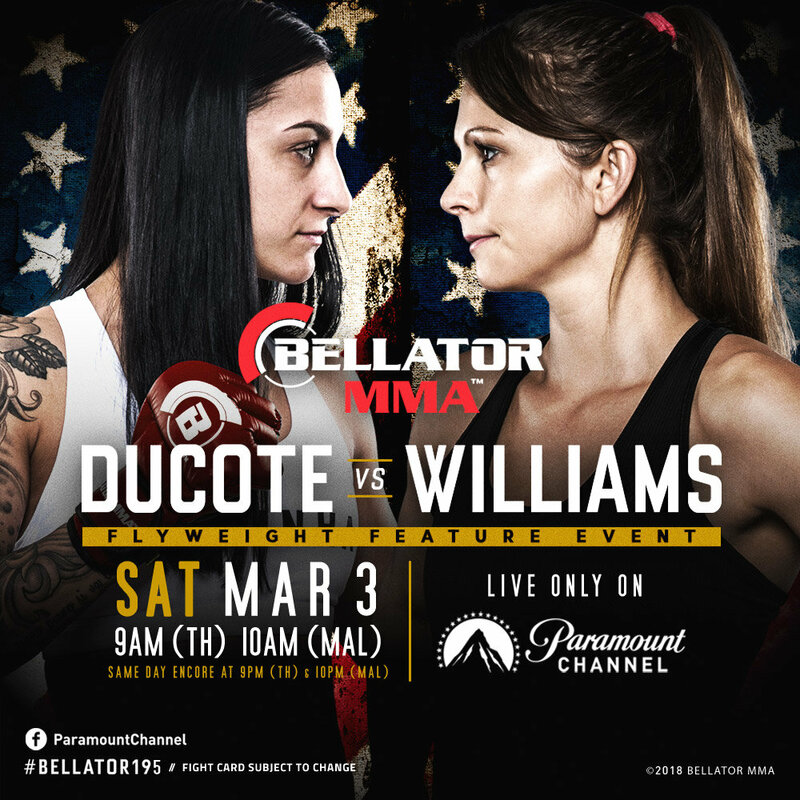 With International Women’s Day happening on 8 March, it is fitting that the spotlight will also shine on the women’s flyweight matchup between Kristina Williams and Emily Ducote in Bellator 195. The event will air live on Paramount Channel on 3 March, Saturday at 9am (TH) and 10am (MY), with a same day primetime repeat telecast at 9pm (TH) and 10pm (MY). It will also air on MTV Asia and MTVph in the “MTV Presents: Bellator MMA on Paramount Channel” block on 9 March, Friday at 10.20pm (WIB), 11.20pm (SG / PH) and 12.20am (MY – 10 March, Saturday). Caldwell has been on a steady ascension to championship status since signing with Bellator in 2014. Ahead of his championship victory over Eduardo Dantas at Bellator 184, which brought his Bellator record to 8-1, the 30-year-old collected five wins by way of first-round knockout or submission. The run was highlighted by a remarkable stoppage of former multi-division champion Joe Warren. Hailing from Rahway, N.J. and training alongside Bellator standouts Phil Davis and Justin Lawrence at Alliance MMA in San Diego, Calif., “The Wolf” also serves as one of the main sparring partners of former UFC bantamweight champ Dominick Cruz. Making her debut earlier at last October’s Bellator 185 event, Kristina Williams stole the headlines when she destroyed opponent Heather Hardy. She will be looking to capitalize on this victory and move into contention for Bellator 195 where she will be up against Emily Ducote. Ducote, on the other hand, will be coming on strong in a comeback effort to add another win to her current (6-3) standing. The veteran has been focusing on self-improvement in all aspects of mixed martial arts (MMA) and will be banking on her MMA experience to win the match as Williams is only taking on her second pro fight this round.